This is an exciting time to be a baby boomer. For many, it means a winding down and departure from our career of many years. Some have been downsized, some are setting sights on early retirement, while others have already retired. Perhaps some of these sound familiar? Playing golf or doing xyz hobby is fun for a time, but not full time. It’s common for people to identify who they are with what they do. Years ago, a friend who was a nurse, but had left her job to be a full-time, stay-at-home, homeschooling mom. She went through a bit of identity crisis because she was so used to thinking of and introducing herself as a nurse. “I am a stay-at-home, homeschooling mom who was a nurse…” just didn’t feel as complete yet. Another segment of baby boomers needing to reorient themselves to a new identity are those stay-at-home parents whose kids have flown the coop and left the nest. This group of people—mostly women—are also looking for their next thing. Many retirees face this same identity crisis. The fastest way out of an identity crisis is to embrace a new one. If at first you don’t know what that is, embrace adventure and exploration. In many ways, retiring is like being 22 all over again: fresh out of college, ready to take on the world. Step into the adventure mindset is a lot more fun than fear and uncertainty. One of the six human needs according to Maslow is “uncertainty”. Uncertainty can mean fear, or it can mean the excitement of adventure. Approach your new career with a traveler’s mindset, where everything we do and every place we go is approached with marvel and eagerness to explore. That’s what we do when traveling. We walk streets and study storefronts, or hike trails and observe the plants we pass by. Adventure heightens our senses precisely because it is new and uncertain. Routine can be good and comforting, safe and even boring, (more to some than others), but it also dulls our senses. There has never been a better time in history to start your own business. Likely, there has never been a better time in the life of most baby boomers than now. Instead of playing games marketed as good for the brain, take on real mental challenges like learning a new skill, a new business, and new technology. Instead of being intimidated by the vast world of online business, embrace it, learn it, master it, teach it. And you need the world. Now is your time to pursue what you love and share your wisdom with a world in need. We often think that when we retire we’ll finally be free to pursue what we want to. That’s true. But most retirees soon discover that time spent in our own “pursuit of happiness” is not complete unless it’s structured around contributing meaningful work in the world while continuing our own journey of learning and growth. The Internet… that fabulous World Wide Web is a virtual freeway of opportunity with access to the world at our fingertips. Don’t be afraid to drive this autobahn of opportunity. Enter the journey, start out in the slow lane if you must, but with each new skill you gain and knowledge you acquire you will pick up more speed and proceed with confidence. 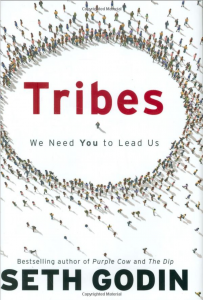 “Tribe” is a synonym for community. The concept, widely quoted today, was popularized by Seth Godin, one of our favorite authors and thought leaders in his book by the same title. For this article, our focus is on building your business by building an audience. But not just any audience. This is not about winning a popularity contest on a quest for more followers and “likers”. Rather, this is about building your audience… your tribe of people who need what you have to offer, whom you can help and who identifies with your unique brand of knowledge and wisdom. We have entered the era of decentralization, where the bulk of the power is shifting from large bodies to lean ones… from bloated corporations and government to smaller ones, that are fit, agile and more adaptable. But more than that, it’s a shift to personable. Even the era of global gurus, is dispersing into smaller communities of greater connectedness. In this era of hyper connectedness, people crave deeper, more meaningful connections. One of our favorite global leaders is Tony Robbins. But if we want to connect personally with Tony, chances of that are very slim. Same thing for all the many millions of Tony’s fans. Yet those fans crave connection with other like-minded individuals and with leaders who inspire them to do more and be more by virtue of contact, content and context. Tony has been doing this for over 30 years. If you’re just starting, give yourself a break and accept that 10 people to your first event or offering—or even one person—is a start. But what if you schedule an event and no one shows up? Then you create that content anyway, and share it freely. One of the best ways to build your audience is to serve them. One of the easiest ways to serve your tribe is to create content relevant to them. Listen to their conversations, poll them… study their answers, understand their needs and angst. They will tell you what they need if you ask and listen. The fastest way to grow your tribe is to listen to what they want and deliver it. Are you attracting the right audience for you? So it’s really not so hard to grow an audience in the hyper-connected, uber accessible social online world of today. But… is it the right tribe for you? Is it the tribe and audience who not only want your services or product, but an audience who can afford what you have to offer? What if you’re trying to build a lucrative business and your audience is telling you everything is too expensive and they can’t afford you, your services or product? If that’s the case for you, then you may have the wrong tribe. So what do you do? Ditch them? Start over? No. To grow your audience you start by creating lots of content. One modest example—assuming you don’t yet have a team to help you—would be to write one article a week for your blog or website, and then to divvy that content up into numerous memes (images with quotes, actionables or info) and post them to social media. Now you’ve taken that one article which you post to Facebook, for instance, and leverage it many times. Nature does this with plants. One seed becomes a tree that becomes many fruits that becomes many more seeds, all from that one seed. In this analogy, that seed is your idea, which becomes the “tree”… your article. Don’t worry, you don’t have to start by doing it all. But just start, one step at a time. Now, you’ve taken just ONE article you’ve written and you’ve turned it into many more things. You can take that even further with video. Create a video session or interview. As you begin to put useful original content out there, you will begin to attract a following. Many of these will become you die-hard fans. Others will just be passing through, taking a fleeting fancy to something you said, which they will likely share… like seeds drifting on the wind. In keeping with the tree analogy, of the many hundreds and thousands of seeds a tree puts out only some of those ever take root. Of those that take root, only some of those ever become strong enough in the right environment to grow into a tree. It’s the same thing with your content. Your ideas are seeds that you plant into articles. Some of those will take off, some will travel far, and some will actually go on to become the trees that serve well. Beyond the fruits and seeds a tree bears, it also provides shade for us, homes for wildlife, cleanses the air and environment… the lungs of the earth. Similarly, the content you create is the oxygen to your brand, your contribution is the heartbeat and your ideas, knowledge and experience shared, is the brain of your brand. The good news is that you don’t have to have it all figured out to get started. Set your compass by the direction you know you want to go, and head out in that direction. Your path will become increasingly clear along the way. As you clarify your vision, your content and offerings will grow in quality, which will attract more of the right kind of audience for you: Your tribe. It’s obvious which ones will be your best customers and clients. That doesn’t mean that you can’t and won’t serve them all. But what it does mean is that you will be able to begin identify the traits of each category and how to tailor your message increasingly, to your ideal tribe. To grow your “level 3 audience”, in other words, the kind of people you want and enjoy working with most who can also afford you, keenly observe what they want and need and what lights them up. The more clear you become, the more you will attract the people you can best serve, and want to spend time serving. Some will decide what you have to offer is not for them, and they will leave. Compassionate entrepreneurs keen on helping everyone may take this personally. It’s hard not to see an “unsubscribe” to your list, or see someone exit your Facebook group, or worse, criticize you, and not take in personally. However, the truth is that we can’t be all things to all people, nor should we try. Think of it. There are people and brands you resonate with more than others. Same thing for people who are drawn to you and your business. Many people pass through many programs before they find the fit for them. Same thing with leaders building an audience. So don’t worry about the ones you “lose”. We can always hope they were served some. We can listen to and learn from any feedback, but if to keep them means to change our course and our focus, then we must let them go and stop trying to do the impossible: please everyone all the time. Be prepared to lose some the first time you offer a paid program or do a webinar. And, be prepared to be totally okay with that. They need to leave for you to “leaf out” and blossom into all that you can be. The fruit tree sheds the blossoms to make room for the fruit to follow. Blossoms in this meandering metaphor, equates to your first wave of fast growth as many are attracted to you, your message and your developing brand. Those will morph and grow into your real audience, those who can relate to you and to whom you relate toward a mutual bonding and belonging. The blossoms are beautiful and pollinate the plants and fruit. From this your tribe is born. Allow nature to take it’s course and do your most important task: keep on growing and contributing and the rest will take care of itself. Now, go do what you do best—or decide you want to do next—and invite others to join you. For more information on growing your business by building your tribe, you may enjoy this article and free training. While this article is speaking to market farmers, the principles are the same for any business seeking to grow your brand on Facebook. For a free 20 minute social marketing strategy session, contact Devani Alderson, with Vital Media Marketing. For a free 20 minute personal and business growth coaching, contact LeAura Alderson.